Please note that some content included in this collection is no longer maintained and that some links may no longer work. 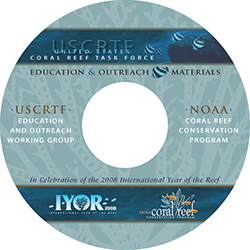 The 2008 Coral Reef Educational Resources CD is a collection of coral reef education and outreach materials created by state and federal agencies as well as non-profit organizations that are part of the Education and Outreach Working Group of the US Coral Reef Task Force (USCRTF). The materials cover a wide-range of topics related to coral reefs, including basic coral biology, coral reef ecosystems, human use, threats, and conservation efforts. The contents of the CD are being provided online as a convenience and to allow wider distribution. The USCRTF formally created an Education and Outreach Working Group by resolution at its third meeting in 1999. The Education and Outreach Working Group operates both as an outreach mechanism for the USCRTF and as a body through which non-USCRTF member organizations, academic institutions, and individuals can take part in the activities of the USCRTF. The Education and Outreach Working Group meets monthly via conference call and works to promote collaboration and helps plan workshop, seminar, and outreach events for the bi-annual USCRTF meetings. For more information or to request hard copies of the 2008 Coral Reef Educational Resources CD, please contact us. Who Should Use These Resources? These resources may be useful for anyone interested in coral reef ecosystems who wants access to a suite of materials to help build public awareness of coral reefs and support for reef protection. These resources highlight the threats to US coral reef ecosystems and provide you with education and communications tools for your coral reef conservation and education initiatives. Formal and informal educators engaging audiences from elementary to high school may find these materials particularly useful. All of the materials presented in the accompanying Web pages, with the exception of a few large video files, are contained on the physical CD. The resources in this collection are broken into seven categories: curricula and lesson plans, student activities, guides and resources, coral background materials, brochures, posters, and videos, slideshows and more. The resources are presented below, by category. Click on the links to the right to navigate to pages dedicated to each category. Over 50 lesson plans and two full curricula in the Life Science and Earth Science subject areas, from grades 3 through 12 are included. These curricula and lesson plans were developed through a partnership between teachers, non-governmental organizations (NGOs) and various branches of NOAA. These are short, fun and educational classroom activities that can be used to complement the lesson plans listed above, or can be used as stand-alone activities. This list includes coloring pages, crossword puzzles, jeopardy games, simple experiments and physical activities that introduce students to marine concepts and issues. A collection of resources that can help teachers bring coral reef education into their classrooms and assist resource managers and communities to learn about coral, get involved in conservation efforts, and minimize their negative impacts on these precious resources. The resources listed below provide an introduction to and background on a variety of issues that relate to coral reefs and other marine resources. These materials present a brief introduction to particular issues, recommendations for action, and organizations that study marine resources. A collection of seven posters celebrating the International Year of the Reef 2008 and one depicting actual reproductive size for 29 Hawaiian fish species. These additional resources and multimedia products, such as videos, slideshows, and a song, are intended to supplement the other materials provided.